Do you love the gorgeous flowers and their wonderful springtime colors? It’s only February midlife woman, have you lost your mind? DigDropDone.com ignited the spring garden planning idea for me. The onset of February truly is time to begin planning that spring garden. I found the information about bulbs to be fascinating and more importantly, quite doable with little more than planning and water. A flower bulb is a marvelous self-contained bundle that transforms into a brilliant, colorful bloom. Within the bulb is practically everything the flower needs to grow and bloom! In laywoman terms, a bulb contains baby flower bud, leaves, roots, stem and food supply. Place it in the ground at the right season, offer up a liberal amount of water as required, and tah da beautiful flowers soon follow! Dig, Drop, Done provides all the information you need to grow breathtaking bulb flowers. Visit the “Ready to Learn” menu for the when, where, and how tos as well as helpful bulb tips. Move on to the Ready to Plant menu for inspiration, planting charts, calendars, and additional bulb resources. Using the Bulb Browser tool, I found these Hyacinthus amethystinus / Brimeura amethystine would work perfectly in my front planter bed. They are gorgeous! Be sure to check the video section, they are hilariously helpful! The videos feature Marcy the mom, Juliana the fashionista, and Evelyn the empty nester. These three women stem from three different lifestyles who offer bulbs help in a funny presentation. Marcy had superb flower bulb tips to help your family be involved in planning and planting. Her science fair idea is the bomb!! Oh and one more thing before I close, a $5,000 yard makeover is up for grabs too! The contest “Bulbs. Dig, Drop, Done” is an educational effort intended to excite women about the amazingly simple beauty of flower bulbs. All you need to do to enter is submit a photo of your yard at Curbside Chaos. 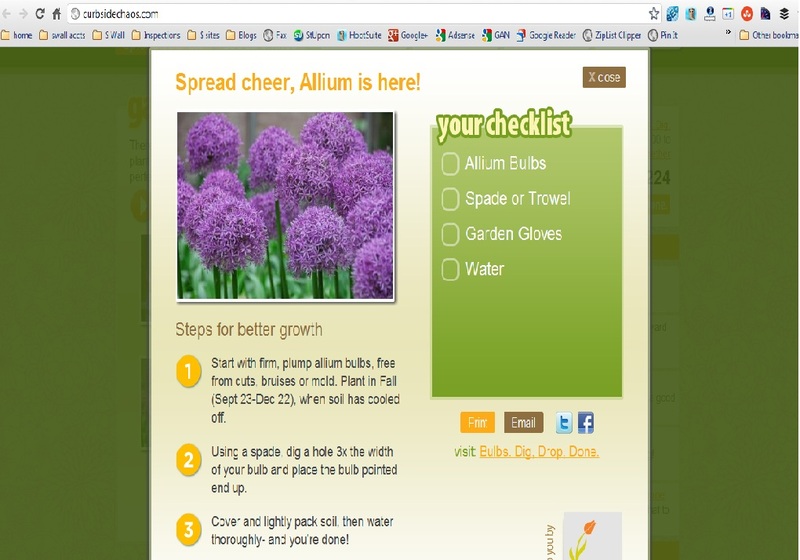 While you are there use the Garden Guru Tool to find the best bulbs for your garden! In addition, for every Twitter share of “Bulbs. Dig, Drop, Done.” will donate $1.00 to Rebuilding Together – a national nonprofit leader working to preserve affordable homeownership and revitalize communities. Whether you plant in beds, pots, or have never planted anything, do visit www.digdropdone.com to learn more, you will be inspired! PreviousDiamonds, a Valentines Day Necessity? I love springtime Kathleen, and the emergence of the Daffodils in my back garden. I also agree that you need to plan your spring garden early, I’m starting to get mine sorted out already. Thank you for sharing this kind of tips to preserve this beautiful flower..Thank you for sharing this to us.. Thanks for a marvelous posting! I seriously enjoyed reading it, you’re a great author.I will make sure to bookmark your blog and may come back down the road. I want to encourage you to continue your great work, have a nice day!